On my laptop with Ubuntu Linux I have installed three browsers: Firefox (different versions, stable and nightly), Google Chrome and Opera. What I can say until now is that I like them all. 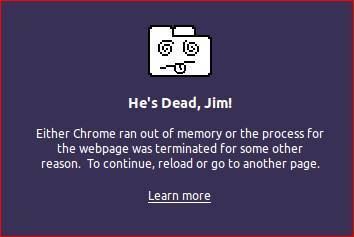 For some time I didn't used Google Chrome so much because it was memory hungry, meaning that if I had opened a lot of tabs, although I didn't used them all in the same time, my browser was slowing down and asked me to kill some pages which apparently were Not responding. Some time ago I have written an other post called How to check what extensions in Google Chrome uses more RAM and CPU but was in my language, Romanian. Now I want to explain a little bit how to increase the speed of your Google Chrome browser (not the Internet speed) although you have a lot of tabs opened. first install the Google Chrome extension called Disable All Extension Plus which you can find it in the Google Chrome Web Store. open the Google Chrome Task Manager with Shift + Esc and look for the memory hungry extensions, like explained in my blog post link written above. You can kill the extension directly from Task Manager but I prefer to do it with the help of Disable All Extension Plus because is more straight forward and also you can easily enable them again one after the other. After restarting Chrome the extensions will remain disabled. with Task Manager opened kill all the pages opened after starting Google Chrome or kill only the ones that you're not intending to use in that moment. You can afterwards to refresh the killed tabs to enable them Please remember that after restarting Chrome this tabs will be enabled again. On Firefox there is an excellent add-on called BarTab which can disable the tabs which are not used preserving theme for future reading.